Meet Andy Bostinto the President of the NGA and the author of the NGA's personal trainer's fitness certification program. He has been in the professional fitness trainer field for over 40 years. Andy was one of the first in the industry to develop a personal fitness certification training program. His vision was always to set the standards for professional fitness training by developing a certification program that would provide the industry with a set of rigorous testing standards. Since 1979, the NGA’s mission has been to set high standards for all drug-free athletes. Through the NGA's fitness certification program you will become proficient as a Personal Trainer, Instructor, Lifestyle & Weight Management Consultant and Clinical Exercise Specialist. "Even if you're not an NGA athlete, take a minute to watch the video to the left. It is a moving tribute to Andrew from his dedicated wife, Francine. They are two wonderful people who combined their talent and love and crafted a meaningful life and business. Very inspirational!" One-on-one executive fitness trainer and nutrition consultant to musicians, film and T.V. stars, directors, producers, corporations and fitness centers. Queens College - lectured: "Value of Exercise and Nutrition." U.S. Air Force Reserve, Director of Royal Canadian Air Force Fitness Program - tested and evaluated Air Force Pilots. Chief-author: "The NGA Trainers/Instructors Certification Course." Contributing writer regarding bodybuilding, fitness and health for various magazines. Co-author: "MENTAL FITNESS - A Pathway to Physical Fitness, Health & Longevity". National Gym Association (NGA), Founder and President - The NGA is a not-profit organization with a dual mission: to support through education and encouragement the art and science of natural strength training & bodybuilding and to provide more than adequate anti-drug information to support its slogan: Drug-Free Athletes of America. The NGA's intent is to speak for and further the betterment of its constituency of gym owners. This takes the form of co-op advertising, group product purchasing, newsletters and legislative intervention, etc. 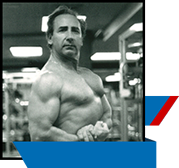 In 1991 converted the NGA to sanction only "natural" bodybuilding contests, which are promoted nationally. Also promotes and sanctions qualifying contests for the NGA Professional Natural Division. Promotes, produces and directs The NGA American International and The NGA United States National Bodybuilding Championships. These events contain top natural amateur bodybuilders as featured in a variety of bodybuilding magazines throughout the United States. Appears on a number of local T.V. programs such as Regis Philbin, Geraldo Rivera, Eyewitness News (Channel 7 with Rolanda Watts), Joe Franklin and Jean Paar discussing physical fitness and bodybuilding in individual and panel formats. Promoted, produced and directed The Mr./Ms. Metropolis and The NGA Physique Classic Bodybuilding Championships. These events contained the top NYC area amateur bodybuilders and were shown on WCBS "Two on the Town" and CBS "30 Minutes." World Bodybuilding Guild (WBBG) & International Federation of Bodybuilding (IFBB) - judge & representative. Officiated national and international events (i.e., Mr. Olympia 1970-1971), including competitors such as Arnold Schwarzenegger and Lou Ferrigno. Won Senior Mr. America, September 10, 1977, Madison Square Garden, New York.